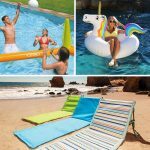 Get ready, get set, get excited for summer! To help you celebrate the season, and keep those kiddos entertained, we’ve come up with a family-friendly idea that’s packed with playground games. It’s called the Summer Park Hop and will turn an ordinary park trip into an extraordinary adventure. 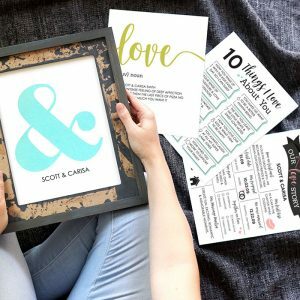 We’ve included a printable invitation, party in the park ideas, and a whole lot fun activities for kids, so we know this is one idea you’ll love! Ready to take a look at the goods? Let’s jump to it! But before we get ready for some seriously rad recess games, we have to give a giant applause to Carisa from Messes to Memories. 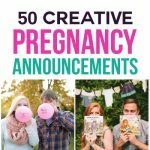 She took all of our ideas and ran with them, creating something that’s so totally cute we can hardly believe it! Thanks again, Carisa! 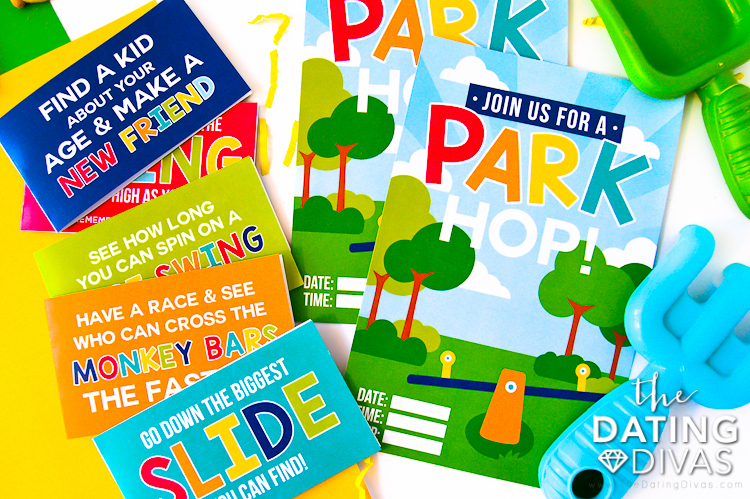 To help you kick off your Park Hop adventure, we’ve come up with not one, but TWO totally adorable invites. It’s up to you to pick which one you want to use! 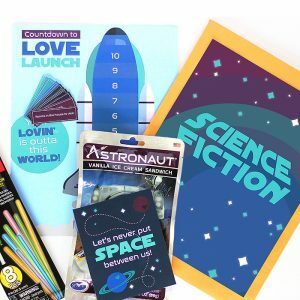 For a party in the park with just you and your kiddos, we suggest going with the family-themed invite. But if you’re more in the mood for a friend-packed adventure, there’s an invite for that too! Simply fill in the date and time, deliver those bad boys, and you’re ready to rock. The whole idea behind this plethora of playground games is to turn an ordinary park trip on its head. After all, why would you want to visit one park when you can visit ALL the parks in your community?! 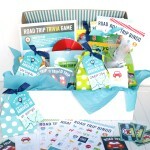 It’s a great way for kids to meet new friends and learn more about your town. So take a bit of time to map out routes to your local parks and playgrounds and then set a time limit for how long you’ll stay at each one. Things are about to get seriously fun. 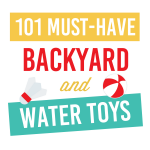 But before you head out the door, go ahead and take a peek at the included checklists. Once again, we’ve included not one, but two to help keep things fresh and fab. 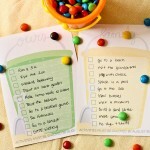 The first included checklist is packed with a pre-made set of ideas and playground games. 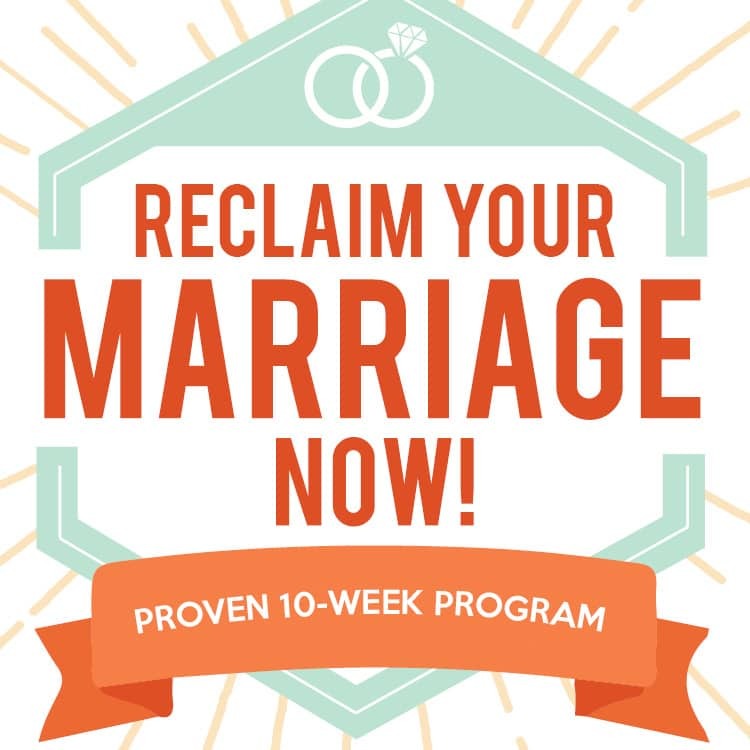 No extra planning needed for this one! 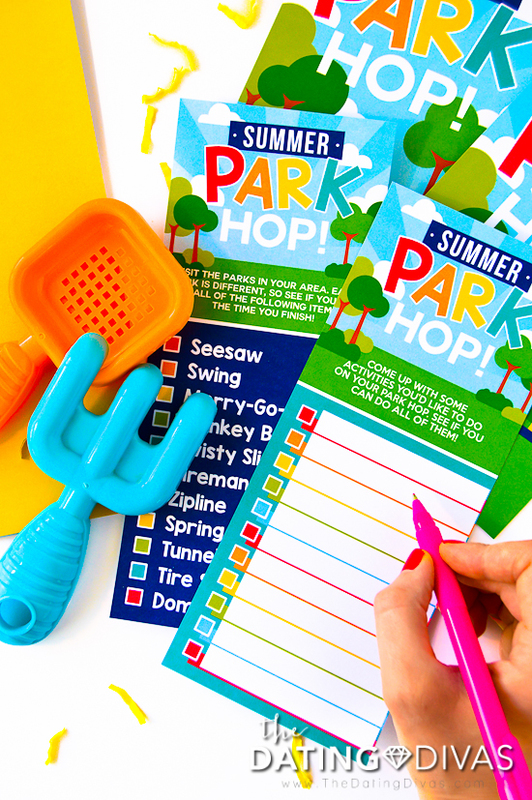 Take the list with you as you ‘hop’ the parks and see if you can do every single activity by the time you’ve finished. And for a little extra pizazz, use the customizable checklist to come up with your own ideas! 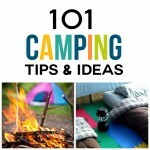 This is a great place to add your family’s favorite, fun games to play outside or some of your children’s go-to recess games. The sky’s the limit! 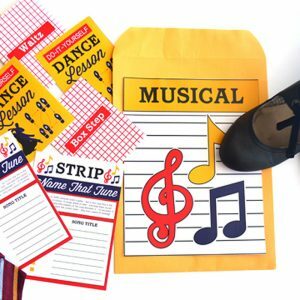 Our checklists include so many classic and fun activities for kids but if you’re looking for even more ideas, or some for older children and adults, take a look at the list below. We’ve included five of our absolute favorite playground games and activities and we’re sure you’ll find something you love. Tag – A true playground favorite! Decide which person is going to be ‘it’ first. Start running! That person then tries to tag someone as quickly as they can. Whoever they tag is now ‘it’ and the game continues. Capture The Flag – An intense game of keep-away! Divide players into two teams and give each one a ‘flag’ (this can be an actual flag, a ball, etc.). Each team gets possession of one ‘area’ where they will place their flag. To win the game, players try to capture the flag from the opposing team and bring it back to their territory without getting caught! Freeze Tag – Another running favorite! This game involves players becoming ‘frozen’ after being tagged. Untagged players may unfreeze frozen ones, but once all players are frozen, the game ends! Crack the Whip – A crazy, curvy game of fun! Be sure to play in a grassy area to stay safe. Everyone stands in a line, holding hands. The person at the front of the line runs around quickly, changing direction often. This will cause the remaining players to weave in and out. Whoever breaks the chain or falls is out! 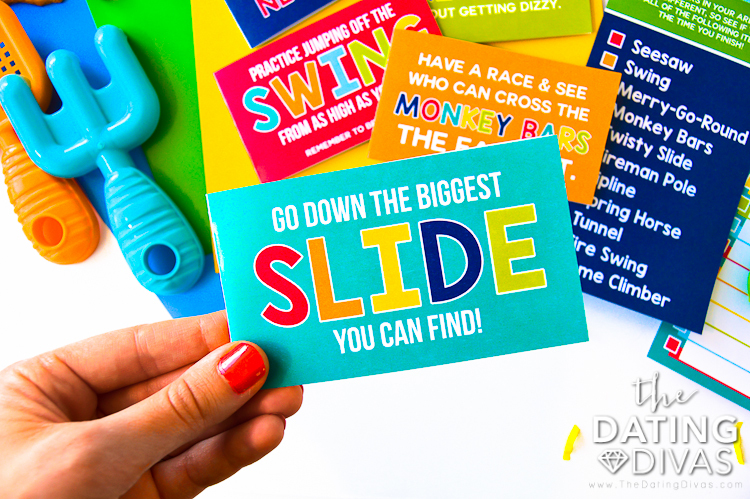 To keep the kiddos entertained and the fun going strong, we’ve also included a handy-dandy set of challenge cards. 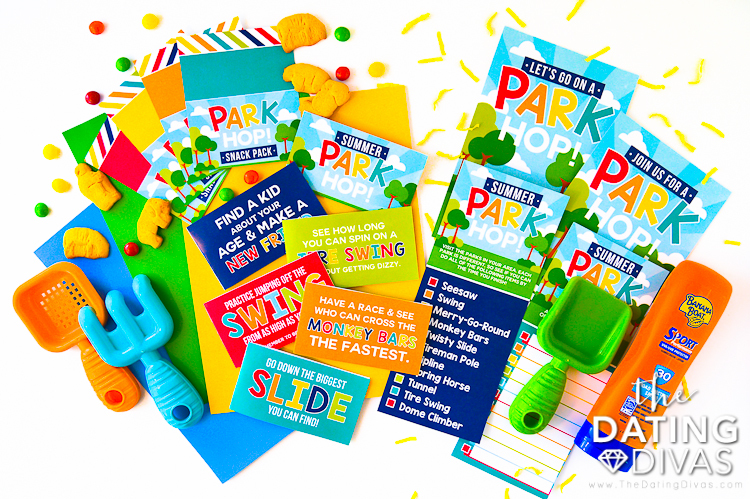 Each card has a specific activity for kids to complete and will test their endurance and playground skills like never before! Be sure to take them along and try a few out at each of the parks you visit. A day full of fun is bound to leave kids (and adults!) a little hungry. 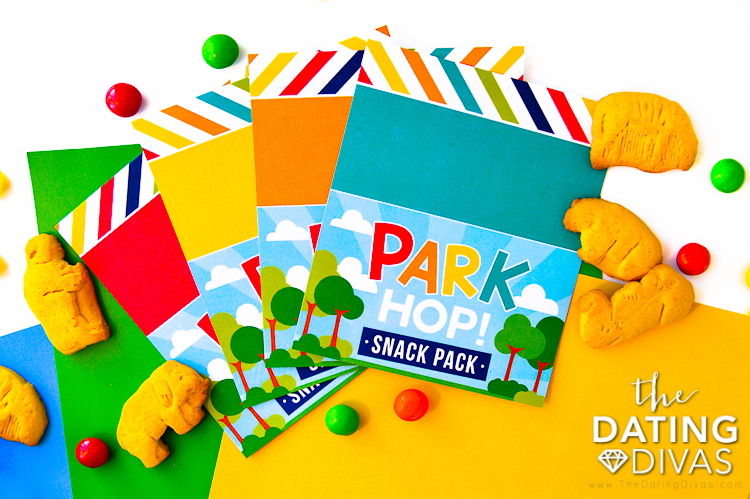 That’s why we’ve included even more fun printables in the form of snack bag tags. Simply print, cut, fold, and attach your snack tags to the top of some ziplock bags (staples work great!) and pile those munchies on in! We always recommend bite-sized, non-meltable treats for hot summer days. 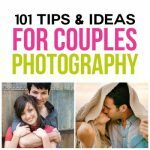 Take a look at the list below for some of our favorites. Are these playground games ideas crazy fun or what?! 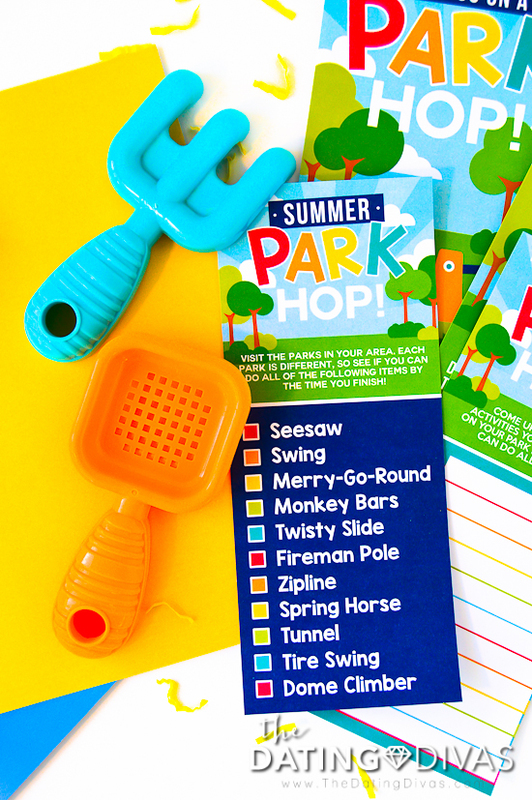 Grab your Summer Park Hop printables today and get ready for some fun in the sun. 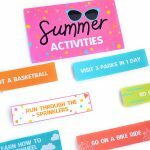 If you're looking for even MORE great summer fun, be sure and check out our Summer Activity Board for kids and our Summer Boredom Buster Printable Pack! i think i will have to do this as one of the activities we do for our halloween countdown. thanks for sharing! Great Idea! We have lots of parks where we are too. It will be fun to go to new areas we have never been to. This sounds like such a FUN family outing! Thanks for the idea:) Your caramel apple idea reminded me of a dessert I recently tried at a friends dinner party.I would call it "caramel apples fully loaded." To incorporate this idea into the park family date I would probably add "picnic" to the list. My friend had bowls with pre-cut apples ready to go inside. Then she had prepared somewhat of a "buffet" of toppings ready to go. I remember some of them were: crushed butterfinger bars, reeces bits, caramel, crushed pretzels, and crushed oreos This made for a fun and creative dessert and is fun for the kids. Love this kid-friendly post! I totally did this on a recent STAYcation to Midway, and the kids loved it… You're such a fun mama! My kids are gonna LOVE this!! This is right in time to bust my kids “I’m bored” summer break! Thank you! This is the perfect family night! This is SO fun! We are always at the park so we’ll definitely use this.